WE ARE LOOKING FOR A PHOTO OF WILLIAM HENRY LANCASTER, JR. – THE 1908 MAYOR OF FRANKLIN, GEORGIA. He was born May 16, 1873 and died November 11, 1952. If you have one, please contact Selmah at the museum by phone at 706-675-6507 or email at info@heardhistory.com Thank You! The Heard County Historical Society’s purpose is to encourage and promote the restoration of landmarks, to assist with family history and research, disseminate historical information, and encourage the preservation or Heard County’s heritage. 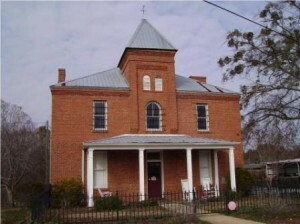 The Society was organized in 1979 and maintains an archive of historical records in the “Old Jail” building in Franklin, Georgia. A visit to the Morton Museum in Gainsville , Texas served as the inspiration behind the formation of a local historical society. Several descendants of Heard County settlers living in Texas proudly exhibited their historical heritage and artifacts unique to that area at their museum. It was felt that Heard County needed a place to showcase our local heritage and artifacts and the old jail became the perfect setting. Steve Lipford, Heard County Commissioner, appointed an Old Jail Restoration Committee to supervise the restoration and preservation of the jail building. With the support of the Heard County Historical Society funds were raised to match a grant given by the Callaway Foundation of LaGrange, allowing the restoration to be done without the use of any county funds. The “Old Jail” is now the Heard County Historical Center and Museum and the Historical Society is always looking for books and other items to enrich the museum. The Historical Society has been instrumental in filling its research shelves. Genealogical books and microfilms purchased by the society are added to the library for patron research. Although the majority of the library contents belong to the society, there are some books that do not pertain to genealogy which belong to the museum. This partnership provides perfect balance to the museum visitors and the serious genealogical researchers.. In 1994, the Heard County Historical Society began a quarterly newsletter aptly named Heard and Scene. Not only does this publication serve to preserve and share the history and information collected about Heard County and its people, but it provides a way to keep its members better informed about meetings, business, and the welfare of its members. The society has many local members who make use of the museum and its staff in the quest for family research and knowledge about the area. We regularly have visitors from other areas drop in to get help in their family trees. There are also many distant members who cannot visit, but enjoy keeping informed through the newsletter. It is wonderful to know that so many people have roots that trace back to our area. The Historical Society accepts offers of artifacts, records, and family histories pertaining to Heard County. Financial contributions are tax deductible. To be come a member, complete the form under Membership Information and mail it in.